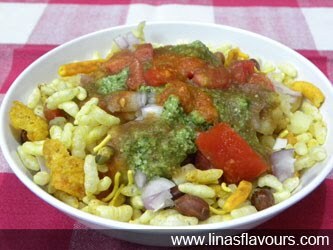 Bhel or Bhelpuri is a savoury Indian snack, one type of chaat. The combination of puffed rice, vegetables and different chutneys make it very tangy. It differs slightly as per the region. Take boiled potatoes and make small pieces with hands. Take a pan and heat oil. Add mamra, salt, turmeric powder and roast it on a medium flame for about 5-6 minutes. Take a bowl. Add mamra, besan sev, peanuts, chivda, chaat puris(crushed) and mix it well. Take four dishes and put this mix in it. Add potatoes, onions, tomatoes, green-garlic-date-tamarind chutneys in all four dishes equally and serve it immediately. You can even add pomegranate seeds and finely chopped raw mango.